Keith Dixon’s newest book, a memoir with more than forty recipes, follows a rich history of novelists like Orwell, Zola and Hemingway—whose interests (some might say obsessions) with food, drink and eating spilled over into their writing. 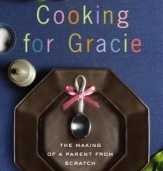 Chime in below with some examples of your favorite food writing by novelists, and we’ll automatically enter you in a drawing for three free copies of Cooking for Gracie. I will always and forever love Laurie Colwin, she was taken too quickly from this world. I also love Never Eat Your Heart Out by Judith Moore. Any book from the Betsy-Tacy series makes me desperately crave fudge just as reading Jhumpa Lahiri is impossible without eating Indian food immediately after. I absolutely love Barbara Kingsolver’s Animal, Vegetable, Miracle: A Year of Food Life. I’m not sure if she counts, but I love Ruth Reichl’s memoirs. And I second the Animal, Vegetable, Miracle recommendation. That’s one of my favorites as well. Charlie and the Chocolate Factory….Richard Dahl. Hey, candy is food too! “At the Restaurant” by Stephen Dunn. Bit of an appetite suppressant actually. . .
Jim Harrison is a hell of a fiction writer, and a hell of a food and drink writer, too. For the longest time I thought there were two Harrisons writing, but no. Same guy. Thanks for entering, everybody! Winners, please email me at [email protected], and let me know where crown should mail your free hardback copies.